So that is it! The final day of 2014 is almost complete and what a great year it has been for the railway. Many great things have happened this year, almost too many to list. The year kicked off with a bang as we hosted Network Rail for their Sport Relief Sponsored Train Pull in March and also welcomed back two of our DMU cars from their adventure at the Bluebell Railway. In to April and many hours of hard work paid off as the LMS TO rolled out of the shed sporting a super glossy maroon finish. We look forward to the finished product there! May the 10th saw a brilliant day dubbed the Big Bus and Train Bash organised mostly by our friends at trent barton. The day featured live music in the car park, heritage buses, a fairground, cadets and much more! A sunny day in June saw HM Queen pass through Duffield on a Meridian and we were there to wave from our side of the fence. The sunny weather continued as we hosted the ever-great Annual Classic Bus Rally at the start of July with some brilliant classic buses making the popular trips to Duffield Station and also tours of the Carsington area. The event was livened up even more-so by the arrival of trent barton's Mango Man to delight the kids. Aside from the Classic Transport Weekend, excellently organised by Geoff Clark, we hosted the Royal British Legion for their special day and a sneaky visit from Secretary of State for Transport Patrick McLoughlin didn't get missed on this day. August saw a brilliant Multiple Memories event with many enthusiasts making the trip to the railway to ride our DMU fleet. September saw a successful Tunes and Chips Evening Land Cruise hotly followed by a nostalgic trip back home for unique Derby Lightweight "Iris", being an invited guest of East Midlands Trains for the Derby 175 celebrations at Etches Park. We also teamed up with Derby County at this time as they helped us design and install a full-size advertising sideboard right behind the goal at the iPro Stadium. Even in the late autumn things didn't slow down. 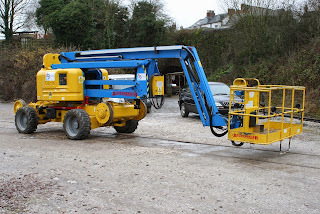 We saw the arrival of ex-Severn Tunnel single car 977975 from Barry, with the intention to return it to mechanical working order so that the Permanent Way team can have something warm, comfortable, economical and faster than their current transport for when they're down the line working away. We then saw the arrival of what could be deemed the final piece of the jigsaw... The Derby Lightweight 2-car set, one of the most prestigious and the oldest surviving British Railways DMU. Rather nice to have all remaining of such a rare class back together and so close to where they were built. And finally, thanks to the efforts of all, we had our most successful Santa season to date. Many happy and smiling faces were seen as we ran 9 days of Santa Specials, taking 22 members of staff for each one. 2015 promises to be a great year. There's many things on the calendar to get excited about and one of my particular favourites is the Murder Mystery evening on the 24th June. We will see our first dip in to on-train catering in the new season and we will host the Railcar Association as their annual Convention rolls in to town at the end of September. If you haven't yet fallen asleep, today still saw lots of progress, not least with the thaw of the snow. A reasonable-sized P Way team turned out to continue with the three-way point relay. I am told today was all about fish plates as they're waiting for the snow to disappear before bolting the track down. The LMSCA had a reasonable team in too with work continuing on the LMS fleet and on the BSK rebuild project. The DMU team checked over the train for tomorrow to make sure it hadn't frozen up over the last few days and some nice touches were made to the Pullman to ready it for opening tomorrow. Progress Tuesday 30th December 2014. The main event today was further work on the three throw turnout in Wirksworth yard with all timbers now in their correct position and all the iron work replaced it remains for screwing down and packing to complete. Amongst the stalwarts ( insane ) attending today were no less than 15 p way staff which goes to show the level of boredom during the Christmas break. Much digging out of ice and snow a major pass time today with passenger services having their fair share as well clearing the platforms and getting the railway ready for new years day services. The pullman buffet also had attention to it's lighting courtesy of DMU gang whilst lone carriage cleaner ( with assistance ) de Christmasfied the rolling stock after a brilliant santa season due in large part to the efforts of everybody involved - a lot of very hard work but well worth the effort. Now that's over it's down to the p way to spend the next couple of months remodelling Wirksworth yard in no doubt terrible weather conditions - as you see, everybody has a cross to bear. Wishing you all a prosperous new year. Fwd: [wirksworths_railway] Progress Tuesday 30th December 2014. Our catering operation in 2014 grew to such an extent that its income came close to that generated through fares. However, three key players; Linda, Issy and Natalie, have moved on to pastures new leaving opportunities for new blood to enter this business. 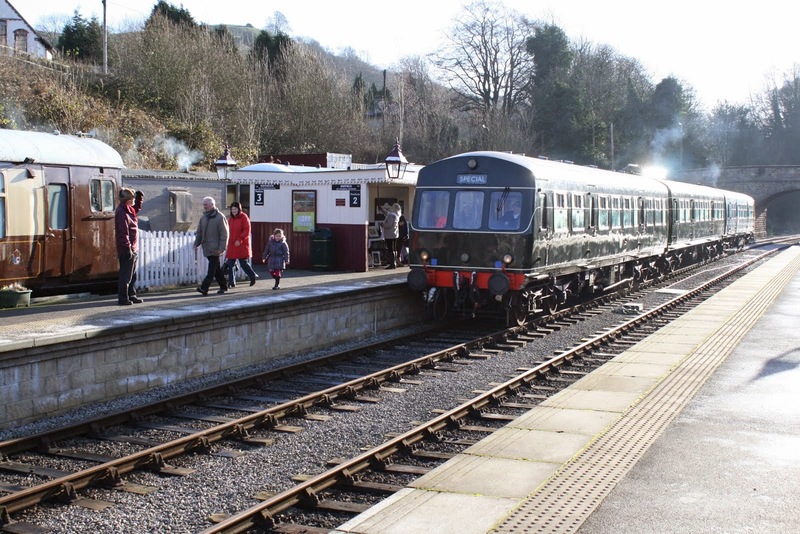 The basic requirement is for the Pullman Buffet Car to be open each day we operate public trains starting on February Saturdays through to five days a week in the peak months and reducing back to a Saturday operation in November ending up with supporting the Santa trains in December. Opening on non public days is required from time to time to provide a service for mytesttrack customers and other groups using our premises. 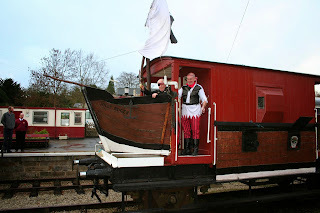 During 2015 we are also putting a toe in the water with on train catering for afternoon teas in the peak months and the occasional evening dinner train. The Pullman Buffet Car maintains relatively civilised hours opening at 0930 and closing after the last departure to Duffield which is normally at 1615. There will also be opportunities to work through the peak periods of the day from around 1100 to 1500. We pay the National Minimum Wage hourly rate at the end of each month by bacs for the hours worked. A clean and tidy appearance is required and holding a Food Hygiene Certificate would be useful but not essential as training would be given. Living locally would also be an advantage. Undoubtedly our catering operation will grow and grow so entry at the ground floor could lead to a very satisfactory career. We were jolly cold today even though the sun was out for most of the day. The Passenger Department occupied itself with creating the usual network of snowpaths around our freezing station and contemplated the need for more snowshovels. The DMU team occupied itself with completing more trim on unit 50253. Down the yard the LMSCA carried on with assorted tasks including door work for the BSK and, nearby, Stokes and Field Probe Inserters carried out some very successful routine maintenance on the Pullman second class, thus eliminating the strobe effect on the interior lights. The theme of lighting continued near the shed where a number of new quality tubes were fitted in the shed paint store. Can I remind all staff not to turn off essentially labelled heaters, in order to prevent the pipes freezing, as it was already minus five when we left tonight. Greeted by a few centimetres of white stuff, just two volunteers had become so bored at home the last few days that they ventured to the railway. It was all about Class 101 E50253. The bump area trimming continued apace and a start was made on wiring in the air/axle panel in the cab. This is part of a process to swap out the more modern LED type to the more original lamp type. Attached a few snowy photos. Well we've done it - our last Santa Train of the season has run its course. As you know this was the most demanding programme we have ever attempted and, with the participation of so many people, probably the most successful and smooth running of any we have attempted before. 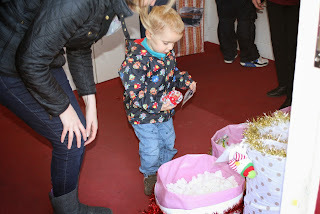 Today's photos are of Logan test driving the lucky dip which was a feature of our Wednesday trains and a final picture of Santa who has been exhausted by all the activity and returns to Lapland after a final superhuman achievement this evening. One of our key volunteers works for DHL and they do wish they could harness this annual achievement of on time deliveries. My sincere thanks go to the whole team and every good wish for Christmas to everyone who supports our remarkable enterprise. May Santa deliver your desired gift and I hope everyone will relax and recuperate so that 2015 can be tackled with renewed vigour. The main event today was the delivery of some £4000's worth of permanent way materials which will ensure we can renew the crossing timbers underneath the 3 way point and adjacent 2 way point in advance of the arrival of the first of our London Underground locomotives. 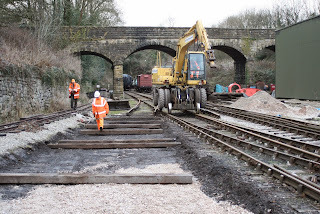 We will also have enough crossing timbers for the new pointwork to access the third Maintenance Facility track which is all part of the movement towards the extension of our undercover renovation and restoration area. The photo illustrates the area involved with the first of the new timbers being laid out. A call at 0715 this morning announce that the first delivery of white gold had arrived despite Lafarge Tarmac knowing our opening hours! This turned out to be the wrong kind of stone and the second delivery had to be returned to the quarry. Eventually all was well and we have all the necessary materials on site. The dmu team undertook checks of the Santa Train for tomorrow's final two trains and then went on to do a whole line check following the high winds we had experienced over the last few days. So as to maximise their productivity the permanent way team required a couple of wagons from Shottle so the "Bubble Car" set off with a Brakevan to collect the wagons on return from Duffield. Thanks to Rob, Michael and Graham for this unusual request. The DST undertook some welding to reinstate wasted areas on Cathryn's axle guides. The Booking Hall turned attention to the coming New Year. Since announcing my intention to retire on the 30th April next year the Company Board have been giving a great deal of thought as to how the management team may be reshaped to keep our enterprise striding forward and cope with the ever increasing demands that growth and legislation places upon us. The following appointments have been made which will be fully implemented on 1st May although there will be a gradual transition over the next four months. Mike Evans will be Managing Director with all functional managers reporting to him and he in turn to the Board of WyvernRail plc. Mike will retain the roles of Operations Manager and responsibility for the fleet of locomotives, diesel multiple units, carriages and wagons. Mick Thomas will undertake the role of Infrastructure Manager responsible for our permanent way and our many structures as we assume full responsibility for these from Network Rail. Leigh Gration will assume responsibility for all "front of house" functions; our Booking Offices and associated accountancy. retail sales, social media and web based marketing with the web shop together with co-coordinating telephone and email enquiries and responses as Commercial Manager. If re-elected by the share holders at next year's AGM I will remain a Director of the Company with a continued involvement with mytesttrack.com where necessary and retain my interest by training as a driver. Change will always bring stresses and strains but I trust all of you will give the team every support to ensure the Railway benefits from this opportunity to move forward. A rather quiet day on the railway today which saw the Booking Office tie up some odds and ends. The Cooke Family were out in force cleaning the Santa train ready for Wednesday and also sorting through some presents to make sure they're in order. We had a visitation from a couple of DMU Group West Midlands members, on the off chance. One of them was Trevor Daw, a well respected member of the DMU preservation world and heater and vacuum exhauster extraordinaire. They were very complementary about how the interior of our Santa train was turned out, despite the occasional care-worn spot from usage. Methods for cleaning Formica were discussed! Our penultimate Santa day with another great turnout of volunteers to deal with the many challenges these days present. All went splendidly with a warm glow as the thanks piled in for a great experience. The trains were supported by the EVRA shop, roast chestnut brakevan and model railway. The value of having the dmu team on standby paid dividends today as one of Santa's gearboxes had lost oil but all was remedied without any impact on our services. The dmu team also removed the gutters from the "stores bubble car" for resale to a willing buyer together with removing the window frames for reuse on the PW "bubble car". The team also managed to energise the interior lights of the PW car demonstrating that they can be fed by battery or a shore supply. The oil store also received a tidy. A defunct heater was exchanged in the Pullman Buffet Car so that the chill can be keep out of the vehicle. Another great day with many thanks to the large team involved. Another marathon Santa day with full trains of very happy children and their adult minders. Supporting acts in the EVRA Shop, Model Railway and Roast Chestnut Brakevan all added to the occasion. As ever, very many thanks to all the people that made the whole show go with military precision. Two more days to go! The dmu team, whilst on standby, continued to deal with the interior of 50253, applied and sanded bodyside filler to the PWT "Bubble Car" and rescued a replacement gearbox for 50599 from stores. 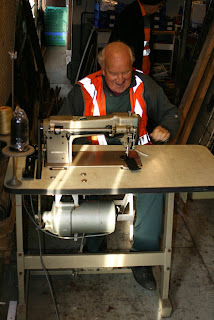 The LMSCA continued with the interior of their BTO together with gangway connection sewing. Another day of sweating the assets! 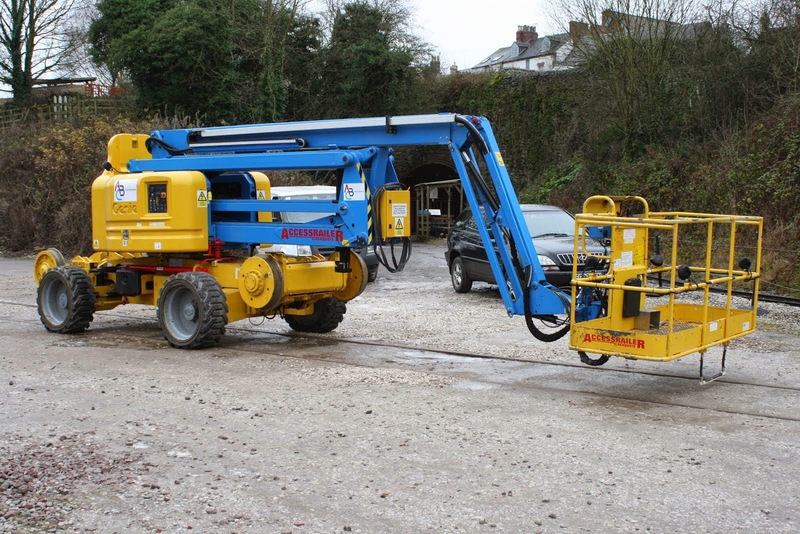 Customers were present at Idridgehay and Wirksworth undertaking various technical things to our economic benefit and it is most encouraging to see these activities at what is normally a quiet time of year for testing. The PWT have been surveying the alignment of the new siding alongside the Maintenance Facility and where the access pointwork should be located. This was determined and time was also taken to strip old ferruls from the track screws recovered from the 3 way point to release the screws for reuse. Col. Stevens would be very proud. My photo today was supposed to be of the surveyors but came out a little blurred ( it was their Christmas meall last night ) so I remind you of the 3 way point in situ with a battery locomotive. Quite a lot of history in the picture with Faraday, our mainstay shunt loco, and Dougal, the PWTs, rotating Pemaquip. Time does really fly. 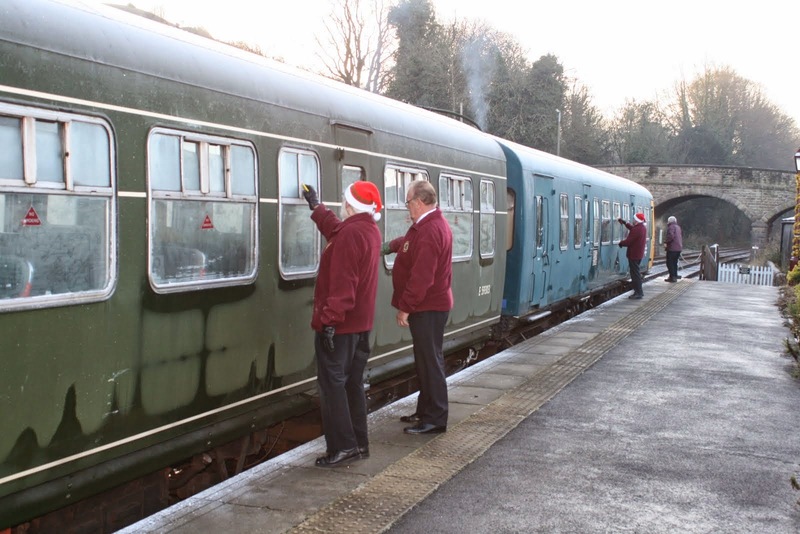 The dmu team have positioned the "stores" Bubble Car for plating up of its windows and fuelled the Santa train for its final outings of the season. The Booking Hall turned attention to 2015 by contacting this year's coach operator customers to see if they will be with us again. 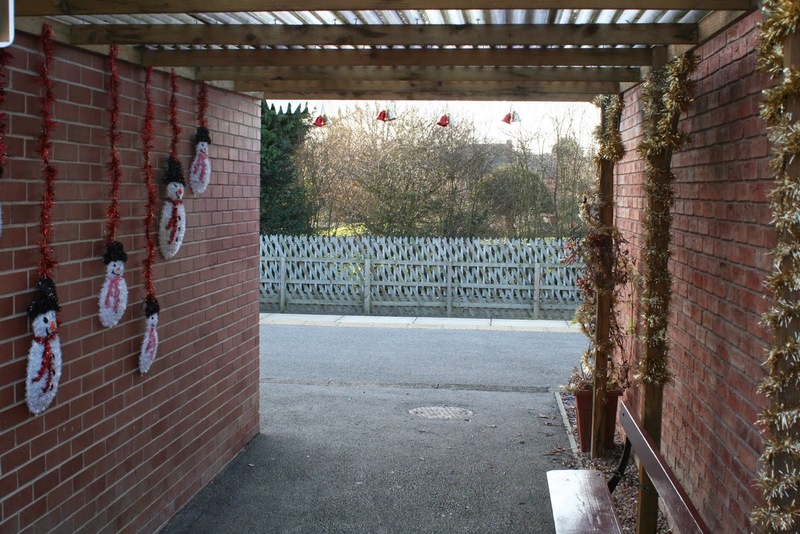 Our second Santa Wednesday entertained, on the first train, some 115 children from the Infant and Junior Schools of Wirksworth together with their teachers and assistants. With all due modesty, this was an unqualified success with Santa being in express train mode and a very happy crowd departed for Christmas dinner at school. The second train of the day went equally well and was a credit to all involved. It was good to see the Clark team taking to their role in catering with glee and contributing to today's great result. We also entertained Radio Derby who covered today's activities and featured on today's afternoon show. The PWT continued with the rather urgent relay of the three way point which we believe was last tended to over 100 years ago apart from our patching in recent years. The stretcher bars, that keep each segment in gauge, are undoubtedly of Midland Railway origin, were tended to by our resident blacksmith and the trackbed cleansed ready for new crossing timbers. Another splendid and gratifying job. The dmu team were on standby in case of any Santa train problems but occupied themselves with the roof of 50599 which seems to require unending chipping off of the old paint. The Pullman Buffet Car was open to support the Santa operations but, amazingly, managed to encourage a group of passing walkers in for lunch resulting in satisfactory results for the day. The Booking Hall greeted today's guests, selling a few more places on the way, and continued to plan for our 2015 activities. A most encouraging and productive day. Today many different groups were on site. The VCT had 8 men on site to complete the Hazelwood Straight Anti-Sheep System and declared it sheep proof at last! They are now retiring for their Christmas meal and won't be back until after the New Year. The DST were split into groups. 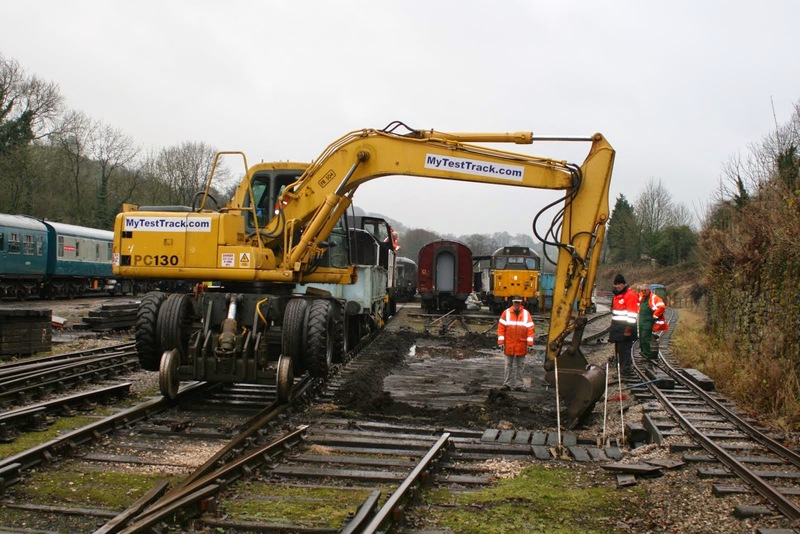 One group worked on the drawbar and buffers of Henry Ellison to help bring around a smooth ride ready for a new steam-hauled dining service coming to a railway near you in June. The other, continued working on Cathryn, although the representative I spoke to didn't know exactly what they were working on. The EVRA coach team were working on the SK. The battery boxes on the underframe were painted and inside a newly repaired toilet water tank was returned to position, so they were flushed with success. Meanwhile, the LMSCA continued working on their coaches along with the BSK which is coming along remarkably well and is also another component to the aforementioned dining train. A lone member of the DMU team worked at chipping remaining paint off the roof of 108 50599 and this nearing completion. Once it's all off a repaint is due and there won't be any rust, it is all aluminium! A large PWay team, back under the guidance of Mick, worked on relaying the three-way point in Wirksworth Yard. The timbers are being renewed as part of a general maintenance programme. The Booking Office processed some last minute enquiries for Santa tomorrow and Anton mulled the wine so that it is perfect. Yet another freezing day in Wirksworth which saw some present organisation and reconciliation as we head towards day 6 of Operation Santa on Wednesday. We welcomed a surprise a test customer (that is we were more surprised than they were) and they enjoyed all day with the line to themselves. The LMSCA fitted the weighty wood much to the relief of Peppy the Van and it really does look great. Another magnificent turnout of volunteers to undertake all the tasks.required to support today's Santa trains which marked the introduction of Mrs Claus into the event. 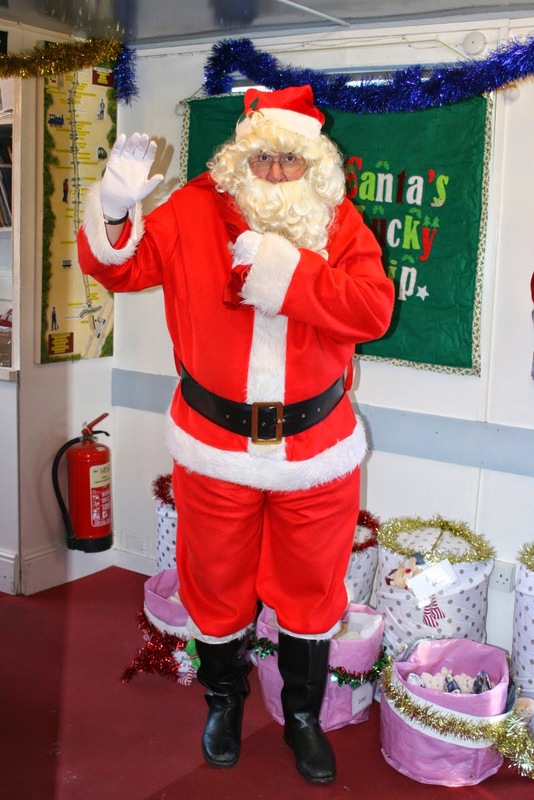 Many, many kind comments as our guests left and perhaps a special mention for Santa who braved all the air traffic control problems to arrive on schedule yesterday and today. The dmu team were not far in case of train problems but managed to progress the restoration of 50253 and continue with renewed efforts on 79018. The LMSCA continued with their work on the Mark 1 BSK. You really need to experience one of our Santa days to appreciate quite how much effort, and how many people, goes into delivering a stunning product and I again thank all those that made it happen. Another great performance from the Santa delivery team with a full house on our three trains. Support acts included the EVRA shop, Model Railway Exhibition and Eric & Anne at the North Pole who have found a whole new revenue stream with their catering operation. 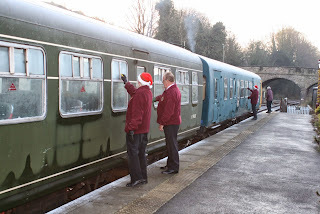 Today's photo show the ritual scraping of the Santa Train windows after a very heavy overnight frost. An intriguing fact this year is how we have reached a more distant market than the more immediate locality as a result of our very clever backroom boys who have influenced our position in the league when a Google search is made for "Santa Trains". Quite a pointer for the future. The dmu team, on standby for any Santa Train problems, managed to continue the restoration of 50253, preparation of the PW "Bubble Car" for painting and removing the last of the seats from 79018 to allow for water damaged ceiling panels to be replaced. The LMSCA tended to their Mark 1 BSK and BTO together with using the sewing machine to create the northern gangway connection on the BTO. An interlude at Whatstandwell, home of the present Assistant Company Secretary and production centre for share certificates! I am organising a tour of the JCB factory at Rocester in the New Year.This is for our Heanor Walking Football Team.However, I thought our volunteers might also be interested. I had a tour many years ago and found it very interesting. There is no charge for this.If you would care to notify our volunteers by email it would be appreciated.I can be contacted at raevison@aol.com or on 07736 105188.No date had been firmed up yet as it depends on total numbers and availability.If there is sufficient interest,coach travel can be organised, obviously the hire, chargeable at cost.Alternatively shared cars is a possibility. A day of deep tranquility in the winter sunshine. We paused for breath before another sleigh arrived and fed the Reindeer. Santa's switchboard answered many phone calls. Down the yard the LMSCA did some flooring and other wondrous tasks on their BSK and the foremen gritted essential places and washed a large pole shortly to have a new lamp on the top of it. I met Network Rail representatives at Duffield to decide the future of the footbridge north of Duffield Tunnel. It would seem that the conclusion is to remedy it on site, rather than demolish Rupert's house to remove it for refurbishment away from site, but you never know. 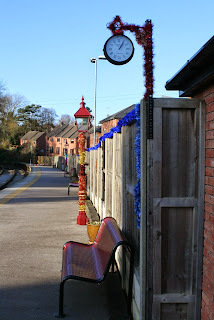 Whilst waiting for NR to appear I experimented with some video of Duffield Main Line. A chilly day where you saw the occasional passing car that had mysterious snow on it. The EVRA coach team were in first thing attending the SK and the LMSCA continued with their BSK. Theres a huge lump of wood to be put into the floor by the corridor which has been prepared. It is so big it nearly bottomed out poor Peppy the Van. This vehicle, will then have a plywood guards floor laid which is conveniently the right thickness for off the shelf products. Mike worked tirelessly once again on the PWay bubble by sanding off any remaining paint and derusting one or two bits. The ventilators have now been primed and sealed up but theres a bit more to do yet before the real painting can begin. Work continued on the 108 to remove any last bits of paint before it too gets a roof paint. Todays picture shows the progress on the PWay bubble's roof. The main event today was the first ever Wednesday Santa Train which worked very well with a team formed from many departments. As ever I am very grateful to those who have taken on board how important these trains are and recognise all the effort put into delivering a well received product. 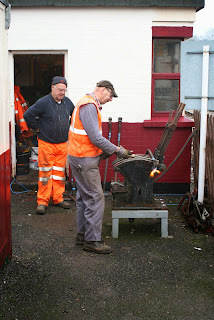 Also today there was a good turnout of permanent way men, illustrated, to start disassembling our three way point which desperately requires new timbers in advance of the locomotive testing agreed for early 2015. The LMSCA continued with their work on the Mark 1 BSK and a tentative start was made on the restoration of the newly arrived Derby Lightweight 2 Car set. The Booking Hall welcomed today's visitors and last minute sales ensured we achieved our own objective for Santa revenue which were some 50% above that achieved last year. All very encouraging! Quite a day with a customer testing two mobile platforms, one of which is illustrated, ably looked after by Richard Buckby but prolonged by a rerailing exercise towards the end of the day. Their presence was added to by our regular "walking stick" customer who was introducing a couple of new recruits to our site. The dmu team removed around half the seats in the new arrival 79018 so that ceiling repairs can be accomplished without damage to the moquette. 50599 has a scrape of its roof prior to repainting and the PWT Bubble Car had paint applied to its recently sandblasted roof. The LMSCA continue their endeavours with the Mark 1 BSK and Stanier TO. The DST reported drilling the holes in one of the spacer plates for the replacement buffers on Henry Ellison but jumped ship at midday to enjoy a Christmas lunch at Shottle. The PWT jacked and packed a crossing nose on their newly re-laid single slip as it had been observed to move under load. 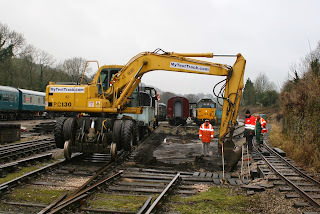 They later turned their attention to stripping down the 3 way point which requires new timbers in advance of the arrival of the first of the London Underground new battery locomotives for test and trials. The VCT reported a further 50 metres of sheep fencing erected and a two fire day by the cutting and burning side of the organisation. They also surveyed a further request for sheep fencing over and above the initial NFU request - you can just see that we will end up with 18 miles of new fencing! So far we have devoted nearly £1000 to this project. Amey were with us on the last day of their structure survey dealing with Wirksworth to Ravenstor - no alarms reported but I am sure there will be more requests for work to be done. It was bitterly cold today and I take my hat off to all the various teams that continued against the odds. The first snow of the winter, but not too bad thankfully. 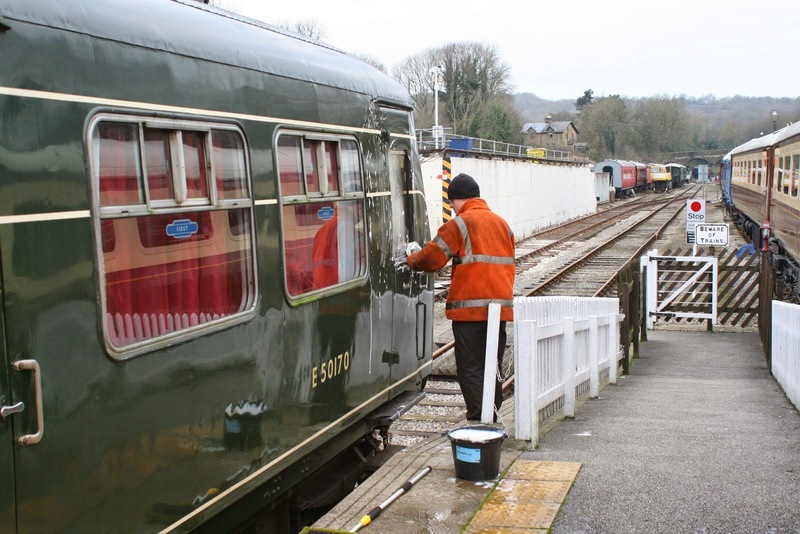 Very quiet today as everybody recovers from the weekend, with just the Santa Co-ordinator in to clean the train. The Booking Office dealt with the odd enquiry and put out a new display of sweets for sale now in the Booking Office at Wirksworth. Another wonderful performance by all the team resulting in peons of praise from the participants. Another 22 people gave up their Sunday to ensure all our guests were treated like royalty and deserve our sincere thanks. At Duffield the team there seem to have uncorked an amazing demand for hot drinks which has added to the bottom line. Today's photo show the mince pie and mulled wine team poised for their next influx of clients. 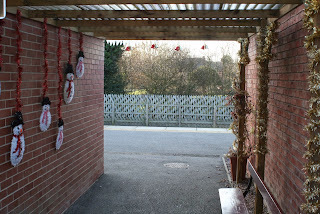 The first day of our Santa season where all the hard work to prepare the Railway for our young guests started to pay off. The actual delivery on the day of our acknowledged high quality product involved some 22 volunteers which is a great achievement as they stepped up to the plate from across all our departments. The whole day resulted in some very happy faces and kindly compliments. Support acts were in the shape of roast chestnuts served from the Bagnall Locomotive Group brakevan and the EVRA shop. The photo shows our first arrival back from the North Pole, a fund raising bric-a-brac stall and the gently simmering brakevan. 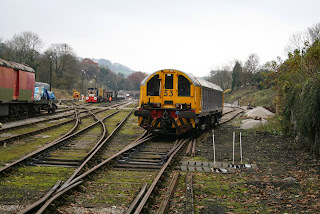 There was a meeting of the Derby Lightweight Group to determine what investment can be made at Wirksworth to finally restore their 2 Car set whilst the dmu team studied ways in which 79018 might return to life after 10 years storage. There was also an intriguing and novel approach to the creating of a log burner from an old gas cylinder. The LMSCA wrestled with returning their sowing machine to life reporting success and further work was undertaken in their Mark 1 BSK. 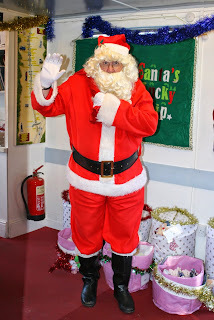 Many thanks to the Santa team special praise for the North Pole team who have considerably bettered last year's presentation there. On another bitterly cold day the teams on site achieved great things. Rob washed the Santa set and ensured the toilet was filled as well as checking everything worked. The dmu team were working on refurbishing EP valves, removing an AWS sensor from one of the ex Severn Tunnel "Bubble Cars" that will be collected by the Severn Valley Railway and started to sign write their support stores vehicle. 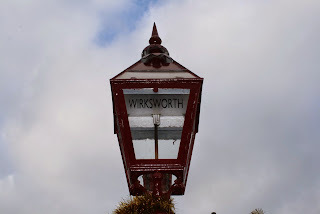 The latter activity was organised by Ben who has provided a very tasteful addition to Wirksworth Station replica lamps with great results. 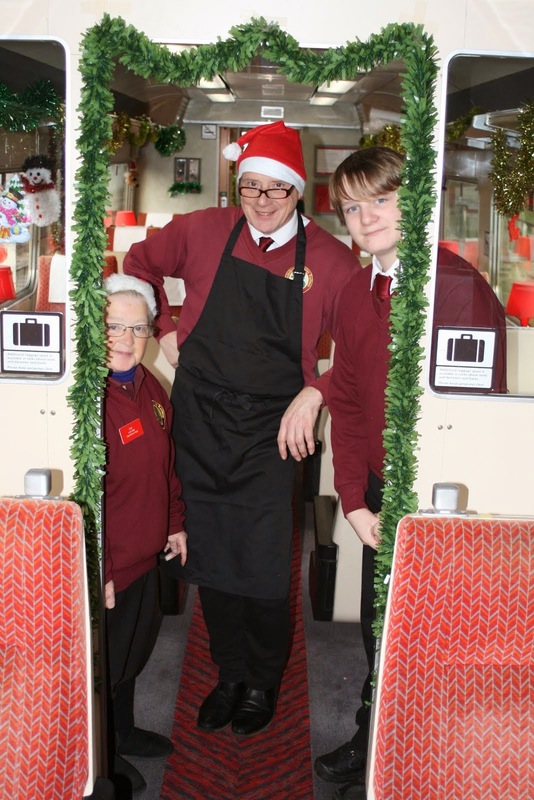 Eric Hills went to town with the decoration of our two Pullman coaches so they will provide a very welcoming environment for the Santa train passengers whilst they enjoy mince pies and mulled wine. 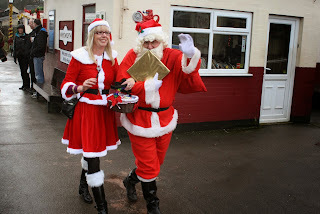 Leigh produced his weekly report of Santa bookings reporting a spectacular 58% increase income, so far, over 2013. This is all virtually on line and my thanks go to Leigh and Robin for facilitating this leap forward. It goes without saying that this cash into the business helps immensely when all other sources have died down through the winter months. Our task now is to deliver what we have promised! I do really look forward to seeing which personalities participate in an active way. The stars of today were all the people bringing the Santa experience closer to realisation. Present were prepared, the Santa Train decoration completed and the train cleaned together with the "Bubble Car" that will form emergency waiting accommodation at Platform 3 should the weather prove inclement. The North Pole team have also achieved great things as illustrated in the photos. I am extremely grateful for all these efforts, stressful at times for those involved, but the Railway will move forward as a result of all their endeavours. The PWT report they have achieved "Herculean" feats to deliver a container of water to Idridgehay ( as part of a general tidy up of this somewhat neglected station ) and then gathered up all the logs generated by the VCT for collection at Shottle. Returning they gathered the Plate wagon for The Duke team and the RUDD which will require emptying for its next role in muck removal. The team also track patrolled between Gorsey Bank and Ravenstor and the LMSCA continued with reconstructing their Mark 1 BSK. The Booking Hall processed yet more Santa bookings and restocked the retail area with items which will tempt our younger visitors over the next few weeks much to the chagrin of their minders - but business is business! We received Fred & Iris who worked their magic on the Mess Hall and the PWT undertook a lot of preparation for tomorrow's adventures. The VCT visited Wirksworth to collect another 500 metres of sheep netting and reported a team of 7 men, two fires and some 50 metres of netting erected. The farmers of the Hazelwood should be very happy but I don't think its in their dna. Santa predominates as the leading cause of activities with the train decorations under work, Wirksworth and Duffield stations receiving attention and the Pullman Buffet Car becoming a festive venue. We are getting closer to all the staff needed for this vital part of our enterprise except for Sunday 7th and 14th November where servers of mince pies and mulled wine are still needed. If you can help visit www.e-v-r.com/rota and get your name down. Mike Billings attempted another flailing excursion but had to repair some faults eventually departing to deal with the embankment at the south end of the Hannages. The DST concentrated on Cathryn's firebox and removed difficult stays. The LMSCA had two teams, one dealing with their Mark 1 BSK and the other installing a refurbished sewing machine which is illustrated by a delighted Derek. The Booking Hall dealt with another significant dose of Santa reservations and very happily received the first firm booking for the Shottle Soiree evenings. On line sales have also processed the first Drive a Diesel Day for 2015 with four participants. PS - I have been in negotiation with Transport for London to test and shake down 14 Shoma Diesel Locomotive that are being converted to battery operation by Clayton Engineering and am happy to report that I have received purchase orders for the first two of these machines. This will stress the PWT as we will have to retimber some of the Wirksworth Yard pointwork before the first one arrives in the third week of January! 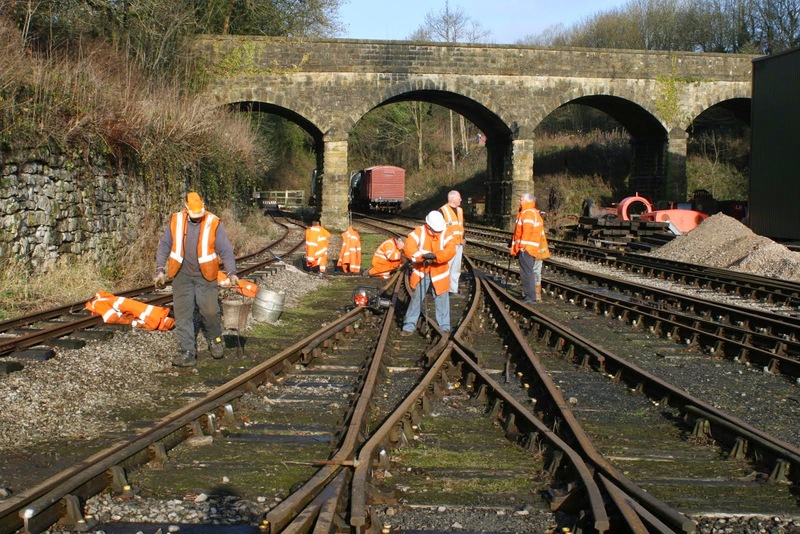 PPS - Further negotiations have also taken place with a training company which will be located at Duffield to bring new recruits up to Network Rail Permanent Way worker standards. All is on course for this activity to commence in February next year. Certainly the calm before the storm today with Santa starting on Saturday. Bookings are still flooding in and the website os now very multicoloured. The LMSCA continued with the BSK. Most of the structure appears complete, with work heading towards the gutters and corridor areas. We welcomed Amey for bridge inspections and a contractor working on behalf of the council who were surveying the standard gauge tunnel as part of a nearby local project.